Dr. Michael Abrankian was raised in Sunnyside, Queens. He graduated from Queen of Angels Elementary School and Holy Cross High School. He attended Adelphi Univeristy and then went on to receive his Doctor of Chiropractic degree from the Los Angeles College of Chiropractic in Whittier, California. Dr Abrankian went on to complete an additional 3-year post graduate diplomate program in Chiropractic Orthopedics at New York Chiropractic College. Upon graduation, Dr Abrankian was a associate doctor in one of Southern California’s largest chiropractic offices were he cared for many various types of spinal ailments. Wanting to be back “home”, he opened the Abrankian Back & Neck Center in 1995. 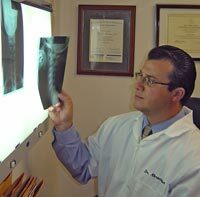 Dr. Abrankian is constantly striving to improve and update his knowledge in the field of spinal medicine. Active in promoting chiropractic in the community, Dr Abrankian has spoken to numerous clubs and organizations and welcomes invitations to address various health topics. Being dedicated to serving the community in every way, the Abrankian Back & Neck Center has sponsored an annual food drive for the Sunnyside Community Center. Dr. Abrankian often attends post graduate seminars sponsored by the New York Chiropractic Association. He was also an active board member of the Romanian Medical Society of New York from 1998-2014 and on December 12, 2010 he was recognized as their “Doctor of the Year – 2010″. 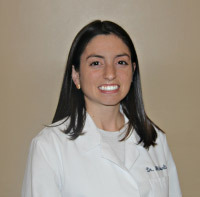 Dr. Aliberti is a New York native who earned her Bachelor of Science degree with a double major in Human Biology from SUNY Albany in Albany, New York. She continued her education in Seneca Falls at New York Chiropractic College where she received her Doctorate in Chiropractic. While pursuing her chiropractic degree, Dr. Aliberti was an active student by being her class’s vice president and a member of multiple clubs. She did her residency program in Levittown, New York where she was her class’s liaison. Being diagnosed with scoliosis at an early age, Dr. Aliberti understands the importance of preventative care. She is currently taking post graduate classes to further her education to specialize with pediatric and obsetric patients.